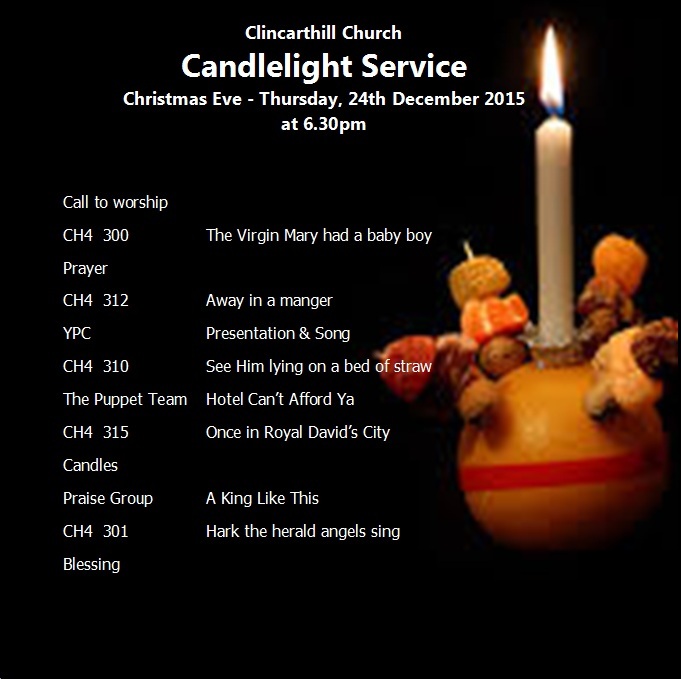 You are warmly invited to our Candlelight Service at 6.30pm on Christmas Eve. We will have a mixture of Christmas songs and Carols. There will be a ‘not-to-be-missed’ presentation of ‘Hotal Can’t Afford Ya’ by the Clincarthill Church Puppets and a meditative time for lighting candles and remembering the real meaning of Christmas. We will finish with mince pies, biscuits, tea and coffee. Also don’t forget our ‘Watchnight’ service at 11.30pm rolling-over through midnight to bring in Chritsmas day. This entry was posted in Uncategorized on 21 December 2015 by admin.